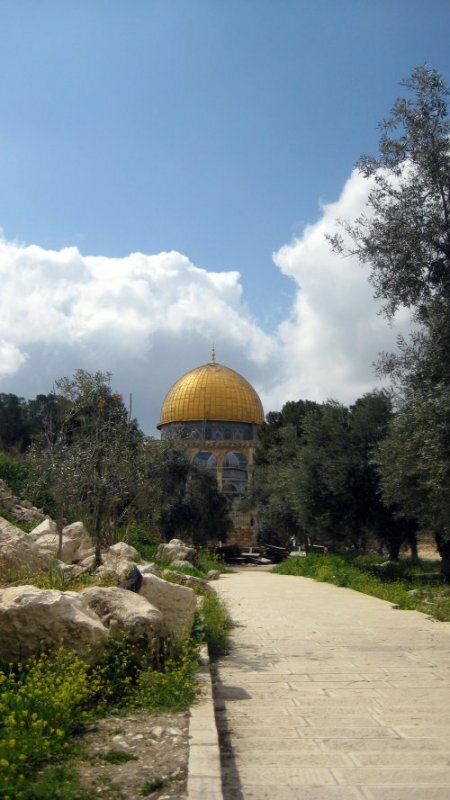 The Temple Mount status quo: Law or Myth? What is History of the status quo of the Temple Mount? Israel plans to maintain the status quo on the Temple Mount, according to Prime Minister Benjamin Netanyahu. In recent months he has issued a number of public statements that were meant to assure the Arab world and the international community that Israel had no intentions to change the status quo. In a telephone talk with King Abdullah Jordan, Netanyahu pledged not to alter the arrangements under which only Muslims are allowed to pray on the Temple Mount. U.S. Secretary of State John Kerry also emphasized the importance of preserving the historic status quo on the Haram al-Sharif/Temple Mount (Ha'aretz, Nov. 6, 2014). Police spokesman Mickey Rosenfeld reiterated that police will continue to enforce the status quo on the Temple Mount (Jerusalem Post, March 22, 2015). Muslim and Arab spokesmen share these sentiments. "Jews do not have any rights on the Temple Mount, not even one centimeter ." said Khamal Katif, vice-chairman of the Northern Branch of Israel's Islamic Movement, some years ago (Yisrael Hayom, June 24, 2009). Arab League Secretary-General Amr Moussa insisted earlier that under international law, Jews and Christians were forbidden from praying on the Temple Mount (World Net Daily, February 17, 2005). King Feisal of Saudi Arabia said in 1977 on Radio Riyadh, "The Jews have no connection whatsoever with Jerusalem and have no sacred places there. The Temple of Solomon does not exist in Jerusalem. Therefore, the Jews have no right to have any presence in Jerusalem." What is this status quo that everyone talks about? The dictionary definition indicates that status quo is a Latin phrase that means "to keep things the way they presently are" or "to preserve the existing state of affairs". The phrase is derived from a Latin phrase used first by 14th-century diplomats who talked about in statu quo res erant ante bellum, meaning "in the state in which things were before the war". In subsequent centuries this phrase was shortened to status quo ante bellum, meaning to return things to"the state in which (it was) before war," such as the withdrawal of enemy troops, return of power to pre-war leadership, and restoration of sovereignty rights as they were previously.. There is a special meaning to the term status quo as it was applied in Palestine in earlier centuries. It was first used by Sultan Osman III (1699 - 1757) who ruled the Ottoman Empire from 1754 to 1757. In 1757 he issued a firman (decree) that was meant to guarantee the ownership and responsibilities of various sites important to Christians, Muslims, and Jews to their then current occupiers or owners. It further provided that in the sacred sites covered nothing could be changed from the traditional way. The actual text of this first firman is no longer available. In the middle of the 19th century Napoleon III of France pressed the sultan to cancel the 1757 firman and restore the situation to what was detailed in a 1740 treaty. Such a move would be beneficial to French interests and detrimental to Russian interests in the Holy Land. Consequently Czar Nicholas I of Russia threatened to invade the Ottoman Empire if the sultan agreed to the French demands. In an attempt to defuse the crisis, the sultan issued a new firman in 1853 that declared that "The actual status quo will be maintained and the Jerusalem shrines, whether owned in common or exclusively by the Greek, Latin, and Armenian communities, will all remain forever in their present state." This new status quo arrangement was recognized by the European powers at the end of the Crimean War in the Paris Peace Treaty (1856) and again in the Berlin Agreement (1878). The status quo since its beginnings in the 18th century was a device to regulate relations between the various Christian communities in the Holy Land. It was never applied to the holy sites of the Muslims or of the Jews. Only in the 1920s did by the British mandatory government extend the provisions of the status quo to the Western (Wailing) Wall and to Rachel's Tomb. At no time (prior to the most recent period) was the status quo concept applied to the Temple Mount. This status quo system worked smoothly during the Ottoman period because Turkish governors possessed a definitive record of traditional practices at each of the holy sites covered. But these records had disappeared when the British conquered Jerusalem in 1917. As a result, during the years of the British Mandate officials could not always authoritatively determine the status quo whenever there were conflicting claims by the various Christian sects; therefore, they always urged the parties to come to a voluntary agreement. On the other hand, during the nineteen years of the Jordanian occupation of Jerusalem and the West Bank (1948-1967) the royal governor again followed the ancient Arab tradition of acting as an arbiter on all status quo questions. Once the Israeli government became the sovereign, it did not continue to use administrative judgment to resolve conflicting claims in the holy sites; instead it left it up to the several Christian communities to sort things out for themselves. (1) Who can ascend to the Temple Mount? (2) Who can pray on the Temple Mount? (3) Who controls the Temple Mount? Over time, these three dimensions have varied independently. No matter whether pagans, Jews, Christians or Muslims controlled the Temple Mount, there were times when the site was open to all, while at other times one or the other religious groups were banned, just as there were times when everyone was allowed to pray on the mountain, while at other times one or more faith groups were prevented from doing so. But one thing is certain: the status quo is not something static but has varied over the past two millenniums, ever since the destruction of the Second Temple in the year 70 CE. 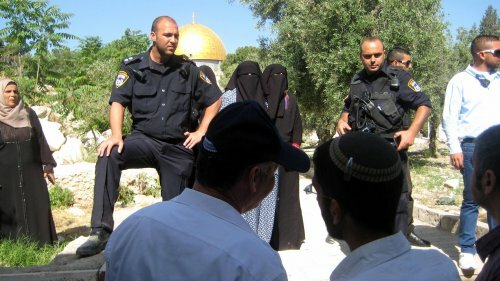 Police separating Jewish visitors from protesting Arab women who are paid by a Muslim organization to disturb the visit of every Jewish group.